Original Editors -Amanda Scott as part of the Bellarmine University's Pathophysiology of Complex Patient Problems project. 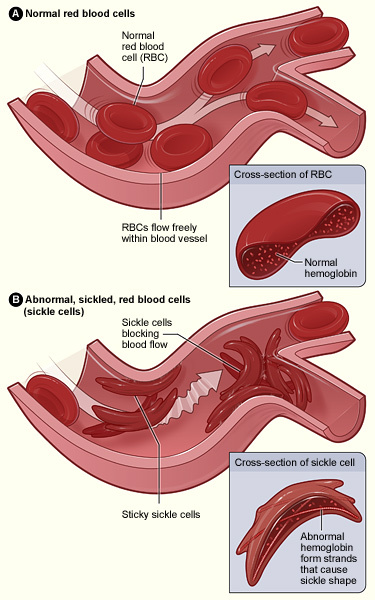 Sickle cell anemia is a genetic disorder characterized by irregularly shaped red blood cells due to an abnormal form of hemoglobin within the RBC’s. The hemoglobin is able to transport Oxygen in a normal fashion, but once the Oxygen is released, the diseased molecules stick to one another and form abnormally shaped rods in the RBC’s. This in turn, causes the erythrocytes to become sickle shaped and unable to squeeze through the small diametered capillaries, leading to occlusion of these vessels. This disease was first described by Dr. James Herrick in 1919, who observed a patient from the West Indies whose anemia seemed to be due to sickle shaped red blood cells. In 1956, scientists discovered the gene abnormality within the hemoglobin protein responsible for this disease. There are various forms of the disease that differ according to the specific type of abnormal hemoglobin inherited. These include hemoglobin SS disease (termed sickle cell anemia and the most prevalent), hemoglobin SC disease, or hemoglobin S Beta thalassemia. The general characteristics of each form are similar, and general treatment is typically the same. Individuals with this disorder may vary in their presentation of symptoms. Occlusion of the capillaries by the sickle shaped erythrocytes leads to acute and chronic tissue damage. Clinically, this can lead to widespread pain throughout the body, termed painful episodes, that may last 5 or 6 days. As the name suggests, these patients are anemic, resulting in a presentation of fatigue, pallor and irritability. Acute episodes of symptoms are typical and may be brought on by physical exertion, extreme temperatures, fatigue or recent infections. Cerebrovascular accidents and acute chest syndrome may also occur as a result of occlusion of the blood vessels. The sickled RBC’s may adhere to the lung endothelium and cause inflammation resulting in acute chest syndrome. This manifests itself as chest pain, fever, coughing, and shortness of breath. Pulmonary hypertension may also result from occlusion in the lungs. Stroke may occur in individuals with sickle cell anemia at a young age and may lead to disability or death. Jaundice may occur in individuals with sickle cell since liver is unable to process the increased number of dead blood cells, leading to a build up of bilirubin. Hand and foot syndrome may also occur if a clot forms in vessels supplying metacarpal and metatarsal bones. Necrosis of spleen may occur due to its susceptibility to clots. This results in red, tender extremities with possible numbness and tingling. In most children, the spleen is destroyed at an early age as a result of sickle cell disease, posing a significant health risk. All infants in the U.S. must be screened for sickle cells anemia. Blood from the umbilical cord is analyzed using a sickle turbidity test to determine if the abnormal hemoglobin type is present. Electrophoresis can also be used to separate the blood hemoglobin and determine if sickle cell anemia is present. Prenatal diagnosis is possible as early as 10 weeks gestation using amniocentesis or chorionic villus sampling at 16 weeks. 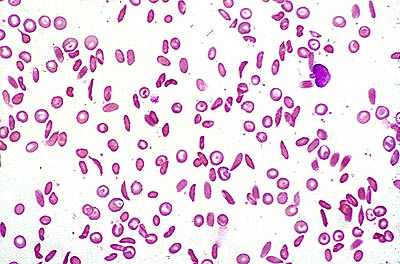 Sickle cell disease is an autosomal recessive disorder, indicating that an individual must inherit two recessive alleles for the disorder to be present. If both parents possess one sickle cell allele, there is a 25% chance that their child will have the disease. The disease results from a mutation that substitutes valine for glutamic acid in the hemoglobin protein. This substitution results in differences in the surface of the red blood cell. A person may have the sickle cell trait if they possess one sickle cell allele; these individuals will be predominantly asymptomatic, but may have some sickle cell symptoms during periods of low oxygen levels. 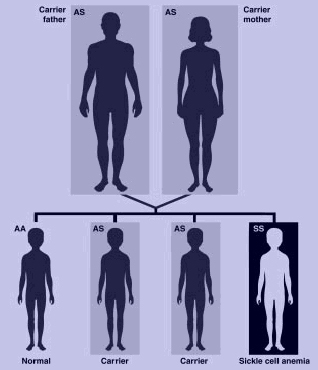 In the following diagram, both parents are carriers for sickle cell disease. Therefore there is a 25% chance of a genotypically normal child, 50% chance of a child with sickle cell trait (heterzygous), and a 25% chance of a child with sickle cell disease. Genetic counseling is available to couples who may have the sickle cell trait and are considering having a child. The genetic counselor can explain to the couple the likelihood of having a child with sickle cell disease or sickle cell trait and present various options for the couple. Bone marrow transplant has been used to successfully cure sickle cell disease. This procedure results in the individual's body producing normal red blood cells and improvement in neurological and pulmonary function has been noted. Bone marrow transplant was first performed as a treatment for sickle cell disease in 1984, and clinical trials demonstrate that 78% of the 116 patients with sickle cell that underwent transplantation were disease free four years following the procedure. However, this may not be available to all patients, and the risk of rejection of donor transplantation or graft-versus-host disease prevents some individuals from undergoing this procedure. Other techniques of bone marrow transplant that may eliminate these risks are currently being researched. Dr. Suzanne Ildstad, a researcher at the University of Louisville, is utilizing a "facilitating cell" during the transplant to better enable the donor marrow to take. Management of pain and anemia symptoms is also given to individuals with sickle cell disease. This may include rest, IV fluids, and pain medications. Hydroxyurea is often used in patients with sickle cell disease. This drug stimulates hemoglobin production and decreases the number of acute episodes a patient experiences. Furthermore, medical treatment is often necessary to address the many systemic complications of sickle cell disease. For example, blood transfusions have been used to treat patients who have had an acute stroke or acute chest syndrome secondary to sickle cell. Hydroxyurea, vasodilators, and anticoagulatants are often used for treatment of pulmonary hypertension. There has been research conducted concerning the use of fetal hemoglobin for treatment of sickle cell disease. The introduction of normal hemoglobin helps to prevent sickling of the red blood cells and decrease painful episodes later in life. Though sickle cell disease is an area that physical therapist could be instrumental in treating, PT's role in addressing this disease has been minimal to date. Therapists could play a large role in education, treatment and possible prevention of exacerbations. Patient education is extremely important for individuals with sickle cell. They should be educated on the importance of physical activity and remaining mobile in order to combat serious pulmonary and other systemic complications. Furthermore, the patient should be taught breathing techniques and incentive spirometry to also prevent acute chest syndrome and atelectasis, as well as retain adequat<span id="fck_dom_range_temp_1269966471921_297" />e lung capacity. Wound care to stasis ulcers that often occur on the hands, legs, and feet may also be indicated for PT management. Physical therapists may also work with individuals, especially young children, who have had an acute stroke secondary to sickle cell disease. Therapists would want to address any weakness, loss of function and neuromuscular complications that may have occurred due to the stroke. Though there are no recommended guidelines for this therapy, evidence has shown that children who undergo rehab have good potential for recovery due to neuroplasticity. Aquatic therapy may be beneficial for some individuals with sickle cell anemia. A recent case study found that two aquatic sessions a week for five weeks resulted in decreased frequency of painful episodes and increased strength of the respiratory muscles, thus perhaps decreasing the likelihood of lung complications. Patients with sickle cell disease may have an intolerance to exercise and may fatigue quickly due to anemia. PT's should be mindful of this and gradually work up to moderate levels of exercise with frequent rest breaks. During painful episodes, therapists should avoid overexerting the patient, and should look out for stressors that my include dehydration or cold. Modalities may be helpful during acute pain episodes, but little evidence is available concerning the effectiveness of these strategies. A case study comparing MRI images pre and post stroke in an individual with sickle cell anemia. Ris MD, Kalinyak KA, Ball WS, Noll RB, Wells RJ, Rucknagel D. Pre- and post-stroke MRI and neuropsychological studies in sickle cell disease: a case study. Official J of the National Academy of Neuropsychologists. 1996; 11: 481-490. A case study describing a young woman's treatment of pain during an acute episode of sickle cell anemia. Resnik D, Rehm M, Rich BA. Case study: Pain and Sickle Cell Anemia. Hastings Center Report. 2001; 31: 29-30. A case study of a young male football player with sickle cell trait who died of rhadbomyloysis during a football training session. Anzalone ML, Green VS, Buja M, Sanchez LA, Harrykissoon RI, Eichner ER. Sickle Cell Trait and Fatal Rhabdomyolysis in Football Training: A case study. Med Sci Sports Exerc. 2010; 42: 3-7. A case study describing a kidney and heart transplant in a patient with sickle cell disease. Audard V, Grimbert P, Kirsch M, Habibi M, Lang P, et al. Successful Combined Heart and Kidney Transplantation in a Patient With Sickle-cell Anemia. J of Heart and Lung Transplantation. 2006; 25: 993-996. ↑ 1.0 1.1 1.2 Campbell NA, Reece JB. Biology: Seventh Edition. San Francisco; Pearson Education: 2005. ↑ Nemours. Kid’s Health Sickle Cell Disease. Available at http://kidshealth.org/parent/medical/heart/sickle_cell_anemia.html (accessed March 30, 2010). ↑ 5.00 5.01 5.02 5.03 5.04 5.05 5.06 5.07 5.08 5.09 5.10 5.11 5.12 5.13 5.14 5.15 Goodman CC, Fuller KS. Pathology: Implications for the Physical Therapist. St. Louis; Saunders Elsevier: 2009. ↑ Blackwell publishing. Evolution. 2010. http://www.blackwellpublishing.com/ridley/tutorials/The_theory_of_natural_selection__part_2_8.asp (accessed March 30, 2010). ↑ 7.0 7.1 Goodman CC, Snyder TK. Differential Diagnosis in Physical Therapy. China; Saunders Elsevier: 2000. ↑ 10.0 10.1 10.2 Rees DC, Olujohungde AD, Parker NE et al. Guidelines for the Management of the Acute Painful Crisis in Sickle Cell Disease. British J of Haematology. 2003; 120: 744-752. ↑ Pathology Student. Sickle Cell Anemia. 2009. http://www.pathologystudent.com/?p=310 (accessed March 30, 2010). ↑ Dynamic. What Causes Sickle Cell Anemia? Corporate Wellness Development. 2007. http://www.oxyclinics.com/SickleCell2.html (accessed March 30, 2010). ↑ BMT for Sickle Cell Disease. Blood & Marrow Transplant Newsletter. 1998; 43(9). Available at URL: http://www.bmtinfonet.org/newsletters/issue43/sicklecell.html. ↑ Ungar L. University of Louisville researcher may hold key to a cure for sickle cell disease. The Courier Journal 2010 Feb 21. Available at URL: http://www.courier-journal.com/apps/pbcs.dll/article?AID=/201002210300/FEATURES03/2210306. ↑ 15.0 15.1 Stewart M. Sickle Cell Disorder and Physiotherapy. Physiotherapy. 1997; 83: 333-339. ↑ Bernard TJ, Goldenberg NA, Armstrong WA et al. Treatment of Childhood Arterial Stroke. Annals of Neurology. 2008; 63: 679-696. ↑ Tinti G, Somera R, Valente FM, Domingo CR. Benefits of kinesiotherapy and aquatic rehabilitation on sickle cell anemia: a case report. Genetics and Molecular Research. 2010; 9: 360-364.